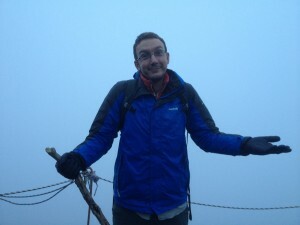 From what I had read on the internet “the thing to do” when hiking Mt. 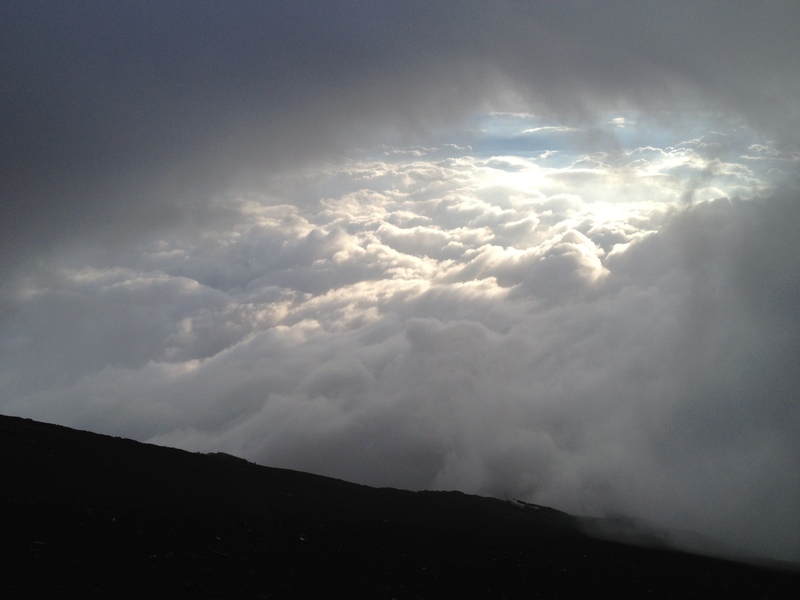 Fuji was grab a bus to the fifth station in the afternoon, hike to the eighth station, sleep a few hours, and rise to make the summit in time for sunrise. But a night’s stay at the seventh station and above would have set me back $70. Screw that. I did things a little differently. You can attack the 12,388 ft mountain starting from a lot of different places, including Tokyo, but I bussed it to Fujiyoshida to set up shop (also home to Fuji-Q Highland amusement park which hosts a number of record-setting roller coasters). I was hoping to outsmart the weather forecast; maybe spending a few days there and striking when there was a break in the rain and clouds. During the ride from Tokyo I chatted with the only other Westerner on the bus who planned to hike the mountain from the base that night and grab the bus out the following morning. 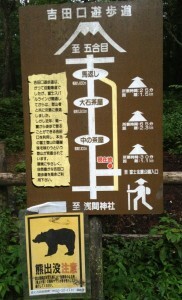 Hiking from the base… now that wasn’t on any itinerary I had read. More on that later. 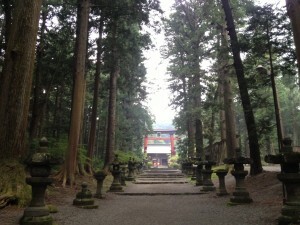 Nifty way to start the hike: the Sengen Shrine at the base of Mt. Fuji. Side note: I have an unofficial travel rule that if a location is no more than a 30-40 minute walk away, I walk it. It saves me a little coin and often times leads to a lot of sights and photo opportunities I’d otherwise miss. It’s also good for the glutes. 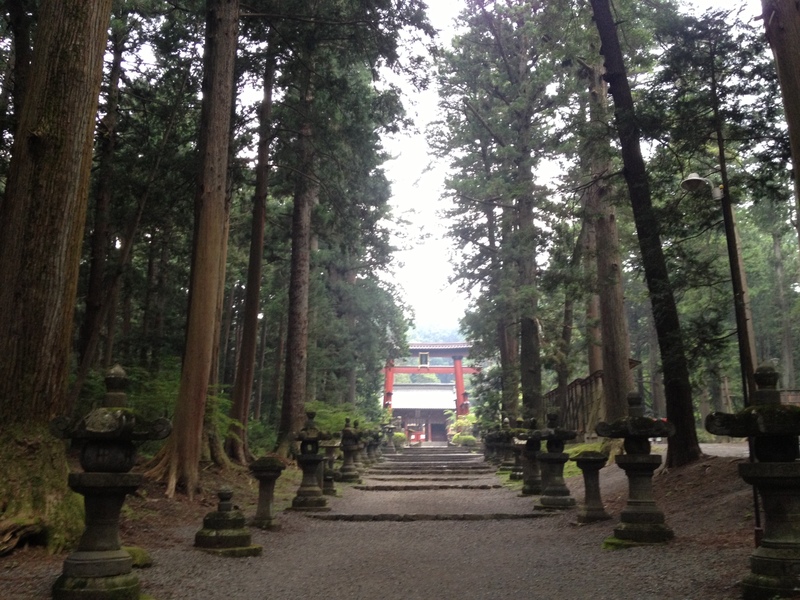 It was 45 from my guesthouse to the Sengen Shrine, a traditional starting point for the trek. Was it wise to add 45 minutes to what was supposed to be about a 12 hour hike? No. But given that I had only slept a few hours the night prior and didn’t have three square meals that day, the whole thing was already asinine to begin with. What more harm could it do? 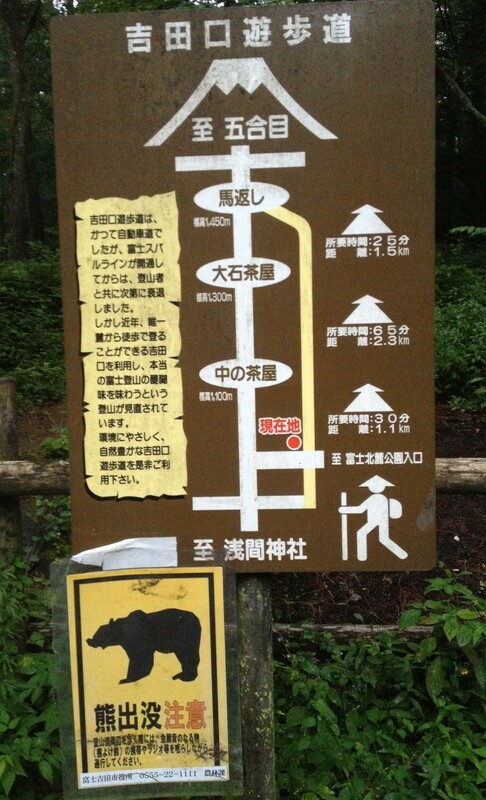 I can’t read Japanese but I’m assuming this sign does NOT say “No bears here”. 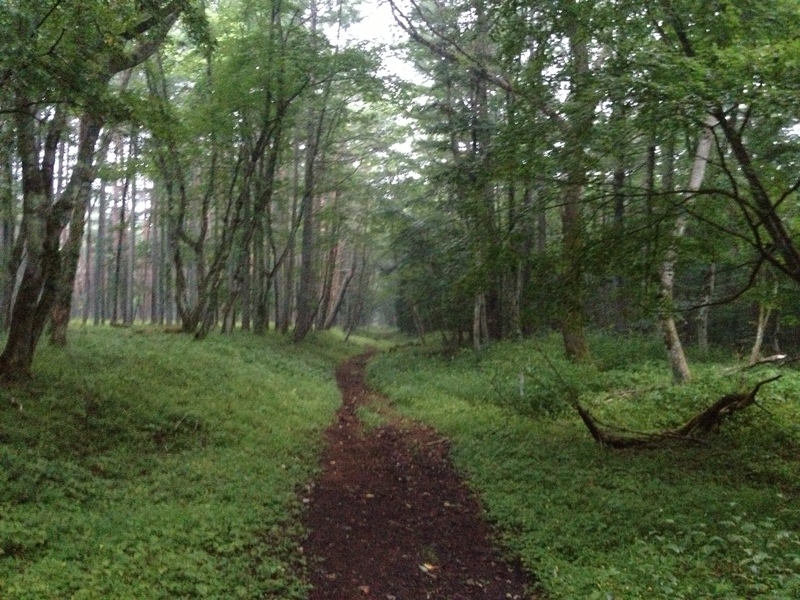 I left the Sengen Shrine around 17:40 with an overcast sky and an infrequent light drizzle. What I knew to expect was about a four hour hike to the 5th station, five hours to summit, and three to four hours to descend. It’s important to note that because most people don’t start at the base I was alone. Like… completely alone. And because it isn’t as popular the signage is exclusively in Japanese if there’s any at all. Given that fact that I was able to navigate it implies no one should get lost but it’s still a little unnerving; especially when you see a sign with a picture of a bear on it. 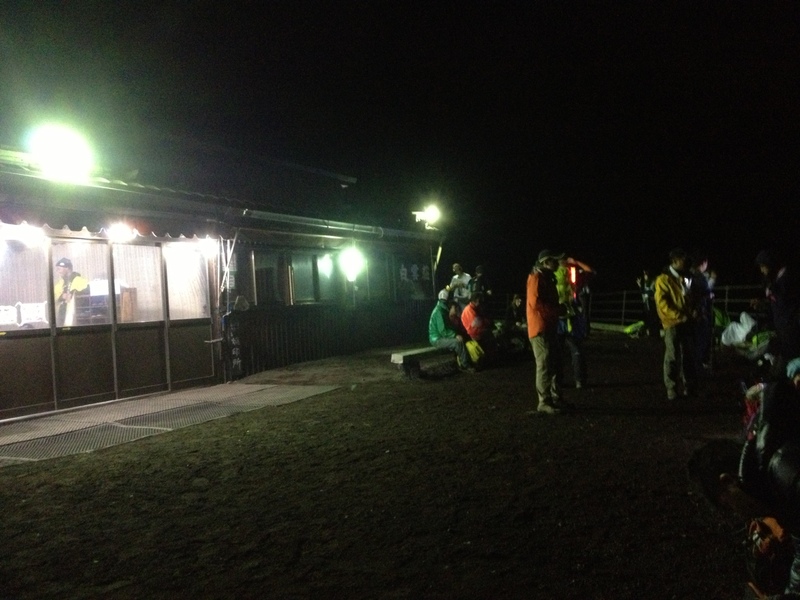 The lack of other hikers and any real mile-markers or checkpoints meant I had no context for my progress except for the knowledge that I should arrive at the fifth station around 21:40. Every time I thought I had been hiking for an hour I looked at the clock to discover it was only 15 – 30 minutes. It was seriously mentally grueling. And then it got dark. Because of the humidity I was completely drenched in sweat and any time I removed my glasses they returned fogged up. I was ripe for horror movie fodder. 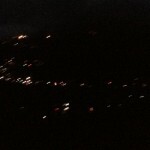 My head lamp illuminated enough of the trail to get me where I needed to go… until the rain came. The extra water made no difference to me since I was already dripping from places I’ll have to ask my doctor about later. But the rain and the humidity mixed to create this wonderfully creepy fog. Multiply that by the steam the poured from my body like an NFL lineman’s head at a Green Bay game in January and my visibility was six feet in front of me at best. It was monotonous and strenuous and–again–really mentally taxing. I did a lot of talking to myself, cursing, and singing Bruce Springsteen songs in my head. I don’t even like Springsteen and barely understand him so I’m not entirely sure how I was able to recreate any of his lyrics to begin with. The beginning of the Yoshida trail before it got dark and spooky. Because I’m so smart I made sure to purchase an extra liter of water before the hike so I could hydrate my precious body. Did it occur to me that “Pocari Sweat” was a weird name for water and that water usually doesn’t look quite so milky? Yeah, maybe for a second, but it was just the perfect size for my bag and so cheap! Pocari Sweat is not water. It’s water-flavored Jolly Rancher juice. Sure, I was replenishing electrolytes my body probably never had in the first place but each sip just made me thirstier which made me drink more which left me with less to hydrate with. And when the rain stopped I couldn’t even contemplate the useless idea of trying to catch water drops in my bottle. Somehow I survived the woods and arrived at the 5th Station ahead of schedule; popped my head into the first “hut” I came across. [It should be noted that this was not “THE” Fuji Subaru 5th Station, which is actually a bit of a diversion from the trail.] The proprietor cut me a deal and let me lie in bed for an hour for 1,000¥ (originally 1,200¥ for the first hour and then something like 5,000¥ for anything longer than that). If I slept at all it was only for a few minutes but it was nice to lie down with a blanket and a pillow and slowly dry out (again I was drenched with rain and sweat–Pocari’s and mine). I got some hot water for my cup-o-noodles and the woman even gave me some warmed up sweet rice pouches for free. She was a complete sweetheart so please give her your business if you ever plan to hike the trail (again, it’s the first hut on the Yoshida trail from the Sengen Shrine). I was also able to fill up my water bottle with the liquid it was meant to carry. Humans! 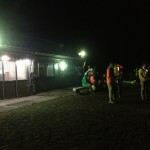 People rest at the seventh station. An utterly horrendous picture of the Yoshida trail line of traffic. The remaining hike proved exponentially easier, at least mentally. The terrain became steeper and more technical but there were stations all along the way with water and snacks and places to sit and the presence of other hikers and frequent checkpoints meant allowed for physical signs of progress. The trail started to get a little crowded around the seventh station and slowly became more and more congested as the summit grew near until around Station 8.5 it was just a line of people. Looking backwards you could see the zigzag of LED fireflies bouncing their way up behind you. While it would have been physically possible to pass people (albeit difficult given the narrow trail) it wasn’t necessary since there was no rush. I guess I could literally be anywhere. You’ll just have to trust me it’s the top. I’m from Southern California and am a pansy when it comes to the cold (the price of living in the best part of America) so I found the top cold but bearable. Cloud cover rolled in and prevented any viewing of the sunrise at all. Because of the weather I still have yet to see Fuji except for internet photos. Oh well. If you had told me what I was getting into and once completing the task would not be rewarded with a spectacular view or a photo opportunity would I have still done it? Yeah. It was a challenge and a challenge is good. But I just spent a dozen paragraphs illustrating I’m stupid so what the hell do I know. It’d be unfair to say there was no view. The clouds broke for literally a few seconds to reveal a sweet reminder of how high we were. This entry was posted in Hiking and tagged 5th station, advice, bullet climb, climb, climbing, fifth station, fuji, fuji-san, fujiyoshida, hike, hiking, itinerary, japan, kawaguchi, mount fuji, mountain, mt fuji, sengen shrine, yoshida trail. Bookmark the permalink.